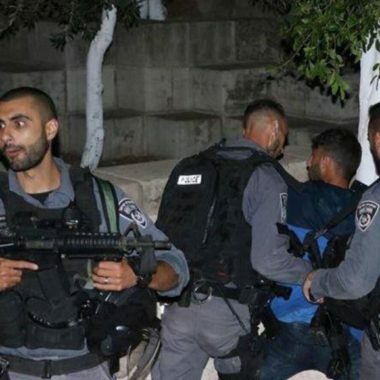 Israeli soldiers abducted, Tuesday, three Palestinians during a nonviolent procession in Salaheddin Street, in occupied Jerusalem. The Palestinians were holding a protest against the abduction and imprisonment of dozens of members and political leaders of Fateh movement, who were taken prisoner by the soldiers in extensive invasions of homes, in several parts of occupied Jerusalem. They carried Palestinian flags, chanted against the escalating Israeli violations, and ongoing political arrests. The soldiers surrounded the protesters and attacked many of them, in addition to chasing several Palestinians, before abducting the Secretary of Fateh Movement in the al-Isawiya town Yasser Darwish, in addition to the member of the Follow-Up Committee in al-Isawiya, Mohammad Abu al-Hummus, and an activist identified as ‘Ahed ar-Resheq.